Helen also leads groups taking this course. The aim is primarily to encourage reflection, experience and exploration of what our ‘soul’ means for each of us. The scope of the course includes music, art, prayer, meditation and energy medicine. This has been a course that was both inspirational and challenging. 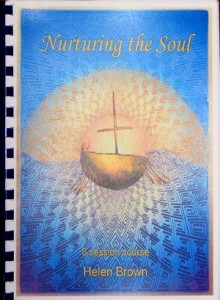 Throughout the eight sessions in our exploration of the ‘soul’, Helen gently guided us along an inner path in keeping with her book on the subject.